Yesterday I was lucky enough to take my walk along the beach at my favorite time–about half way between high and low tide, with the tide going out. It’s my favorite time because of the tidal pools. What I like about tidal pools is that they are never exactly alike. Even pools that regularly form in about the same location vary in shape, depth, behavior, and duration depending on the sun, sand, water and wind. What they trap varies as well. Some have beds of shiny shells. Some have rivers leading back to the receding sea. Some have walls so shallow that it seems the water isn’t trapped at all, but merely hanging out there by choice. Others have walls steep enough to make them an excellent makeshift kiddie pool for toddlers. 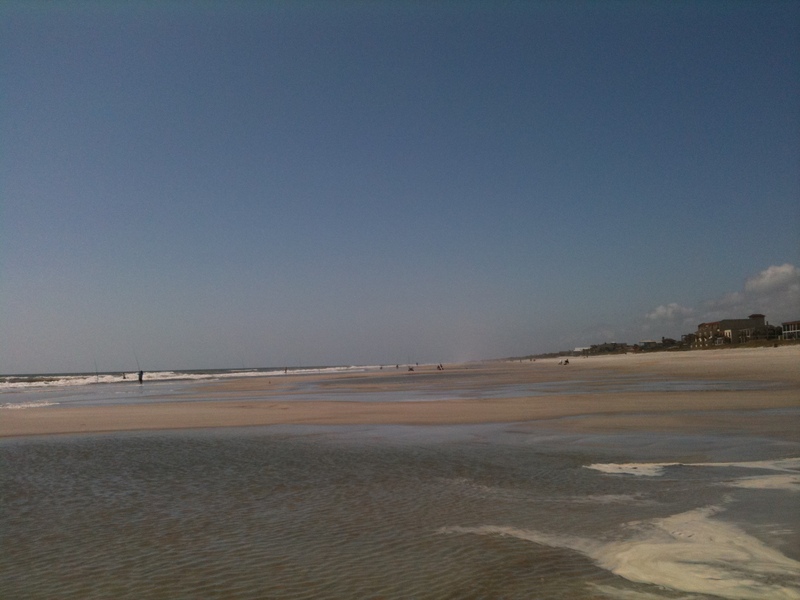 Lately the tidal pools at Jax Beach have been home to schools of tiny fish. Ranging from less than 1/2 an inch to almost an inch and a half long, these groups of fish trapped in the pools, or scurrying along those temporary streams between some of the pools and the sea, have broken up my walks with stop and point activities. “There’s another batch!” I tell my husband as I point and stare. This wrecks one purpose of my walk–to log exercise miles–but is perfect for the other reason I put my feet to the sand–creative inspiration. I love watching the worlds formed by each pool, with its unique characteristics and inhabitants seemingly unaware that I’ve already passed half a dozen such worlds in the last quarter mile of beach. Each started with the same ingredients, but created something original. That’s what we artists do every day. In a former life I published an ezine and one of its most popular features was a page of potential story titles or ideas punnily called the “Title Pool.” Readers would submit entries to be posted on that page for all to use or misuse as they saw fit. I now keep a private Title Pool file for puns, phrases, or snippets of songs, poems or conversations that catch my attention and seem like they may lead to something. Create you own and see how it captures and inspires your ebb and flow of ideas.